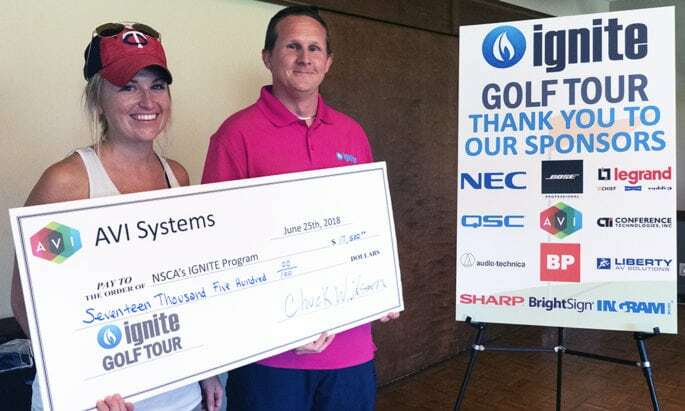 The National Systems Contractors Association raised $17,500 on Monday, June 25, for its IGNITE program during the Midwest Outing of the IGNITE Golf Tour. Currently, the AV industry faces a workforce shortage. The IGNITE program is an initiative to attract, engage and encourage students to join the audiovisual industry. The money raised goes directly toward addressing the issue. "I promise you, with the fundraising that we've done, we're going to do some really ... cool things," said Kelly Perkins, Education Foundation Program Director at NSCA. The Midwest Outing was hosted at the Wild Golf Club in Prior Lake, Minnesota. In partnership with AV integrators, manufacturers, and others, the tour continues this fall to its second stop in Atlanta, Georgia. 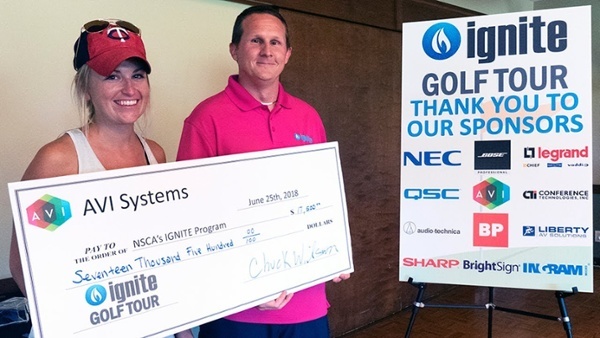 For more information about the IGNITE Golf Tour, check out our events page. Go here.